Four Ways to Ensure Your Company Is Your Best Product: Even If It’s Not Your Company. A few weeks ago, I had the opportunity to attend the Lean StartUp Conference. It was a great experience, and I’m glad our CEO recommended I attend (and that our company invests in this type of professional development). I’ve had an interest in learning more about Lean and agile methodologies because they’re a big part of our work with clients, and Nick thought this would be a good opportunity for that. Most of the presentations were rock solid. They were jam-packed with nuggets of live-tweeted wisdom that fanned the flames of inspiration along with stories of perseverance and success that added long-term fuel to the fire. Despite MojoTech having matured beyond the start-up stage several years ago, I will still be able to make good use of the energy and ideas generated by Lean StartUp. Your company should be your best product. Since starting at MojoTech, I‘ve said on more than one occasion that while nearly everybody else is focused on the delivery of our services — building elegant software solutions that solve business problems — MojoTech itself is my focus. While my teammates around me are busy shipping excellent products, I’m busy making sure we are excellent. MojoTech hires people who improve our team. This doesn’t mean every Software Engineer who is hired is better than the previous, or that we would turn away a Product Manager who doesn’t have more experience than all our other PMs. It means that everybody needs to raise the bar somewhere. Even new team members (in any industry) with limited professional experience have that capacity. Certainly, these types of candidates are much more challenging to find, but for a small, growing agency, it is critical. We hire people who improve our ability to meet client demands in the short-term and expand our ability to meet demands in the long-term. Rather than hiring for specific skills, we hire for capacity to master new skills. We hire people we feel will genuinely enjoy being part of our team and with whom our team will enjoy working; not from a social standpoint (although that is important as well), but at a professional level. We spend almost half of our waking hours together. Compatibility at the office is more important than compatibility at happy hour. MojoTech promises candidates the opportunity to do their best work, and we also set the expectation to deliver your best work. That isn’t just a top-down mentality, it’s peer-driven. We must hire only people who share that expectation. Even before reading Eric Ries’s The Lean Startup, I was applying this approach to transitions at MojoTech, without realizing it. I guess being surrounded by a team of agile developers and Lean practitioners, I picked it up through osmosis. It probably explains why the book and conference created so many simultaneous “ah ha” moments and “duh” realizations. An employee handbook allows a company to distribute information consistently to all employees. It can ensure that everybody has access to resources that inform decision making, and it helps make everybody aware of the benefits available to them. A handbook also sets expectations and can protect a company by ensuring compliance with state and federal regulations and meeting insurance requirements. Because handbooks aren’t traditionally high priority for small tech companies, it’s no surprise that MojoTech did not have one when I came on board. It’s also no surprise that when I first brought the idea up to Nick, he wasn’t amped up to have me get started. I realized shortly after that initial conversation that it was actually my first iteration of the Lean process. What I’d “built” was still just an idea, but it was enough to collect some measurable data from which I could learn. Following that conversation, I shifted my approach from creating a document to protect MojoTech to creating a beneficial resource for the team. The first release took the form of a “Team Info” site, which was basically just a website that could be accessed only by Mojos and contained the majority of what would be expected from a handbook. Rather than directly distributing it to everybody, we made everybody aware of where they could find it... when they were ready. The site was met positively, and the information available on it was continuously updated and built out to make it more beneficial. It was later replaced when we began using an online tool for all HR information. Having already gone through several iterations of the Team Info site gave me a strong grasp of what we needed from the tool. We used the site as the basis for how we shared information through the new software tool, and the end result has been successful. 3) Celebrate your team; individually and collectively, professionally and personally. People are social creatures. Even the introverts among us (such as myself) have social needs at the foundation of our psyche. As such, we are energized by affirmations that our efforts are noticed and appreciated, and our spirits are lifted when we are recognized as individuals as well as parts of a larger group. There are many ways to recognize team members, and the right option will depend on your company’s culture and values, and most importantly on the person or team being recognized. All activities have some associated cost, whether it’s money, time and energy, or even just attention. Your resources, in all those areas, will also impact your approach. Parties: Let the theme or venue be determined by the person or group being recognized. Team Lunch: This falls into the “collective” category. Providing lunch for the team, whether once a month, weekly, daily, or somewhere in between, is one way to continuously show appreciation for your team. It has a nice secondary benefit of giving members of the team more opportunity to engage with one another. 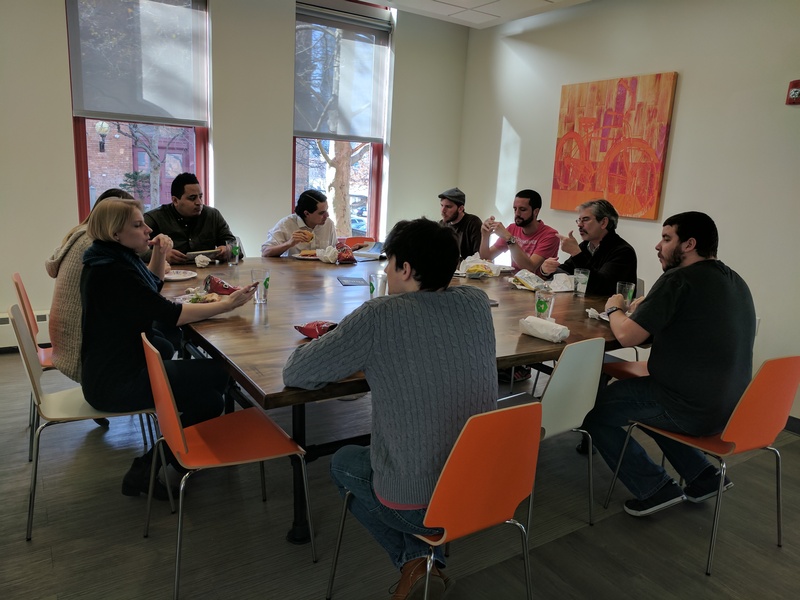 We recently added a large, square “dining room” table to our PVD office that seats 14 at once. I’ve really enjoyed breaking bread with teammates with whom I’d rarely spoken before we had it. Personalized gifts: a great dining experience; a videogame system; family package to a museum. There are also many ways to recognize and show appreciation for your team that don’t break the bank. Get a fun “trophy” that can be awarded to people on a regular interval. We award a Sonic Screwdriver to a team member who has gone above-and-beyond in some way that month, and the winner then gets to select the next month’s recipient! Gift company-branded baby hats to celebrate a team member’s growing family. Host an ice cream social at the office in honor of person’s or team’s accomplishment. Invite your team to include their significant others at company events, where appropriate. All of the above, regardless of cost, have the ability to create a lasting impact, both on the person being recognized, and those around them. They do not need to be restricted to company activities. Celebrating the birth of an employee’s child, the completion of a marathon, or involvement with a charity event are all examples of times when a company can enhance the connection between its team members. In my experience, at MojoTech and everywhere I’ve worked, the best results have come from recognition that is closely aligned with the interests of the person being recognized, and when it is delivered in a way that makes them feel like the people around them, not just the company they work for, appreciate them and their effort. You should be able to ensure that your team has the equipment and resources available to get the job done, without keeping the Apple store on speed dial or gold plating your widgets. You don’t need the best of everything, but equipment and “infrastructure” should never be a blocker. We limit “red tape” and minimize any lead time to get things fixed or replaced, and that allows us to address our equipment and facility demands as needed. Our track record of success and growth has allowed us to purchase good equipment, but we did not achieve that level of success because we bought nice things needlessly. We did it by investing in our people. Buying a good engineer a great computer doesn’t make them a better engineer. Giving them access to training tools, covering conference and travel costs, curating a professional resource library and organizing weekly tech talks does improve their engineering ability. It may be (certainly is) more expensive, but the benefits of investing in the person using the keyboard greatly outweigh investments in the keyboard. It isn’t necessary to go out of your way to be scrappy, but you also shouldn’t throw money at problems. Throw time and energy at problems, and the better solutions you come up with will eventually throw money at you. Rely on enhancing your strengths to move you forward rather than straining to overcome weaknesses (unless those weaknesses will put you out of business). In other words, make what your company is and already has the best that it can be; and don’t try to change what you are. Whether it’s defining your hiring strategy, making an effort to recognize your team’s hard work, intelligently investing in your employees, or crafting the best method to implement policy changes, there is always room for improvement. Focusing on improving your company, in addition to improving your products and services, will give you a competitive advantage in your industry. While these are just some of the ways we keep MojoTech internally strong, so that we remain a strong partner for our clients, I’m curious to hear your thoughts. Please share your ideas about how any of this applies to your company, or make other suggestions for focusing internally, in the comments below.